Passed away at 72 years of age. She is predeceased by her parents, Joseph and Violet Dean; twin sister Madonna Hann; brother-in-law Franklin Hann; and sister-in-law Carol Dean. 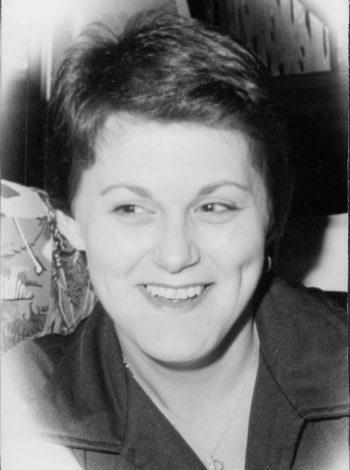 Left with loving memories are her devoted husband of 52 years Edward (Ret’d Fire Captain); son Dean(Nan); daughters Jo Ann Nippard (Howard) and Jill Druken (Leo); and her brother Maxwell Dean; her cherished grandchildren, the joys of her life, Joram, Amanda, Nicholas, Ayla, Rebecca, Julia and Ronin. Also leaving to mourn is her Special Aunt Inez Manning (Wes) of North Harbour, Placentia Bay and a large circle of family and friends. Betty dedicated many years supporting the ladies auxiliaries of the American Legion and the St. John’s Regional Fire Department. In addition to volunteering, her passions included expressing her creativity through ceramics, crafting, cake decorating, and gardening. Nothing offered Betty more pleasure than the time she spent making memories with family and friends, most especially those at the cabin. Visitation will take place at Carnell’s Funeral Home, 329 Freshwater Road, Sunday, August 14, 2016 from 7 to 9 pm and Monday August 15, 2016 from 2 to 4 pm and 7 to 9pm. Funeral service to be held at Carnell’s Memorial Chapel, 329 Freshwater Road, on Tuesday, August 16, 2016 11am. So sorry to hear about your loss. You are a great daughter. I know you & your family are taking care of each other. Jill, Rebecca and Julia, so sorry for your loss. Wow how much the girls look like their nan. Thinking of you all during this difficult time. Sending our love. by Jill, Connor, Claire, John, Elieen and Pam. Sincere condolences to Betty’s family. Rest peacefully sweet lady. so sorry to hear of your mother’s passing. Thinking of you during this difficult time. Sorry to hear of Betty’s passing. Please accept our condolences. So sorry to hear of Beth’s passing. We will keep you and your family in our prayers during this difficult time. So sorry for your loss. Our deepest condolences from all of us at Jasco. So sorry to hear of Betty’s passing. We have great memories of time spent together at dances and other functions. Please accept our sincere condolences. RIP Beth. Sorry to hear of Betty’s passing. Please accept our sincere condolences and know that our thoughts are with you at this sad time. Ed and family sorry to hear of Betty’s passing our thoughts are with you at this most difficult time . Mr. Lupien and family I can not begin to tell you how sorry I was to hear of Mrs. Lupien’s passing. I have many found memories of her at the American Legion and I recently talked to Jill about memories at your cabin. Our families have known each other for well my entire life time and I am sure it predates that. I hope her and mom get together for a game of bingo now it was amazing to see how many cards the could play. Ed, so very sorry to learn of Betty’s passing.. She was a good friend in school and later through the fire department through the auxiliary and on conventions. I know you will surely miss her. RIP Betty. Ed and family and Aunt Inez and family. So to hear of your mom’s passing. Our thoughts and prayers are with you during this time of sadness. I have a lot of great memories that I will always cherish of Betty , especially of my younger years with Betty and Madonna in North Harbour, PB. I am very thankful that she was part of my life. To all her family and friends, especially Ed, Aunt Inez, Jill, Joann, and Dean, take care of each other. To Ed and All The Family: So sorry to hear of Betty’s passing. Our thoughts and prayers are with you all during this most difficult time. May God grant her eternal Peace. Ed and family, I am so sorry to hear of Betty’s death. I pray that God would comfort each of you in your loss. Remembering so many good memories of Betty and Madonna when we were all young together, movies, hanging out together , just lots of fun, and then she met you Ed , and we all knew you were the love of her life. I am grateful to have had twin cousins like Betty and Madonna. To Aunt Inez, we all watched as you came alongside of Aunt Violet and Uncle Joe and helped raise those two little girls after the death of their mother. I am sorry for your loss and pray that you will be strengthened wit h the knowledge that you will see them again in heaven. Love you all and again, sorry for your loss. I realize how difficult it is to lose your Mom and no words are going to help you get past the grief. Only time and memories will ease the sense of loss. To Ed and family, sorry to hear of Betty’s passing I have so many wonderful memories of the good times we had. My thoughts and prayers are with you and your family during this very difficult time. So very sorry to hear of Betty’s passing. Our thoughts and prayers are with you all today and the days to come. Jill so sorry to hear of your Mom’s passing. Thinking about you at thus difficult time. Sorry to hear of Betty’s passing.Thoughts and prayers are with you and family. So sorry to hear of Betty’s passing. Thoughts & prayers are with you all. Ed and family, so sorry to hear of Bet’s passing. So many great memories of our time on Albany Place. Meeting my husband through Ed and Bet the good times at Argentia..she was a true friend so glad I saw her when I was home in 2014. Love you Ed I am in New Brunswick visiting family going back to Maine tomorrow. Will give you a call Monday. Wish I could be there for you.